Explore Lunenburg's surroundings by going to Grand-Pré National Historic Site (in Grand Pre) and Graves Island Provincial Park (in Chester). Next up on the itinerary: take in the architecture and atmosphere at St. John's Anglican Church, examine the collection at Fisheries Museum of the Atlantic, admire all the interesting features of Bluenose II, and kick back and relax at Hirtle's Beach. For ratings, traveler tips, maps, and tourist information, go to the Lunenburg travel planner. Halifax to Lunenburg is an approximately 1.5-hour car ride. In September, daytime highs in Lunenburg are 22°C, while nighttime lows are 15°C. Cap off your sightseeing on the 4th (Mon) early enough to go by car to Yarmouth. Yarmouth is a port town located on the Bay of Fundy in southwestern Nova Scotia, Canada. Change things up with these side-trips from Yarmouth: Ocean Explorations Whale Cruises (in Tiverton), Mavillette Beach Provincial Park (in Mavillette) and Le Village Historique Acadien de la Nouvelle-Ecosse (in Lower West Pubnico). 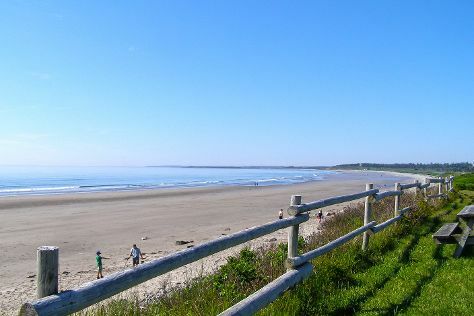 Next up on the itinerary: enjoy the sand and surf at Port Maitland Beach Provincial Park, get outside with Yarmouth Links, choose your vessel at The Song of the Paddle, and view the masterpieces at Art Gallery of Nova Scotia Western Branch. For reviews, other places to visit, photos, and other tourist information, read our Yarmouth online itinerary creator. Traveling by car from Lunenburg to Yarmouth takes 3 hours. Alternatively, you can do a combination of taxi and bus. In September, daytime highs in Yarmouth are 20°C, while nighttime lows are 14°C. Finish up your sightseeing early on the 8th (Fri) so you can go by car to Annapolis Royal. Annapolis Royal, formerly known as Annapolis, is a town located in the western part of Annapolis County, Nova Scotia, Canada.Today's Annapolis Royal evolved from the 1605 French settlement of Port Royal (briefly Charlesfort), renamed in honour of Queen Anne following the Siege of Port Royal in 1710 by Britain. Step out of Annapolis Royal with an excursion to Prim Point Lighthouse in Digby--about 38 minutes away. Next up on the itinerary: take in nature's colorful creations at Annapolis Royal Historic Gardens, examine the collection at Port-Royal National Historic Site, steep yourself in history at Fort Anne National Historic Site, and make a trip to Annapolis Tidal Generating Station. To find maps, traveler tips, and tourist information, use the Annapolis Royal trip builder. Getting from Yarmouth to Annapolis Royal by car takes about 2 hours. Other options: do a combination of bus and taxi. In September in Annapolis Royal, expect temperatures between 24°C during the day and 11°C at night. Cap off your sightseeing on the 12th (Tue) early enough to go by car to Halifax. Explore the numerous day-trip ideas around Halifax: Hope For Wildlife (in Seaforth), Lawrencetown Beach (in East Lawrencetown) and Peggy's Cove Lighthouse (in Peggy's Cove). There's still lots to do: examine the collection at Maritime Museum of the Atlantic, stroll through Point Pleasant Park, browse the collection at Halifax Central Library, and take in the waterfront at Halifax Waterfront Boardwalk. For reviews, other places to visit, where to stay, and other tourist information, you can read our Halifax trip generator. Drive from Annapolis Royal to Halifax in 2.5 hours. Alternatively, you can do a combination of taxi and bus; or do a combination of car, ferry, and flight. In September in Halifax, expect temperatures between 24°C during the day and 14°C at night. Cap off your sightseeing on the 18th (Mon) early enough to travel to Sydney. Sydney is a population centre and former city in Nova Scotia, Canada. Get out of town with these interesting Sydney side-trips: Miner's Museum (in Glace Bay), Louisbourg (Louisbourg Lighthouse & Fortress of Louisbourg National Historic Site) and Highland Village (in Iona). 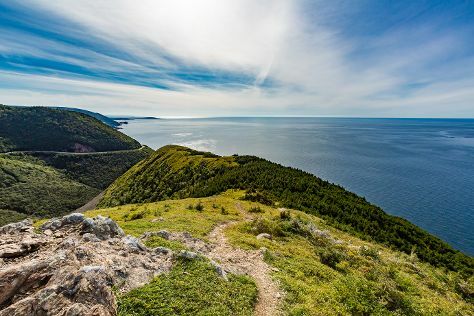 Next up on the itinerary: cruise along Cabot Trail, don't miss a visit to The Big Fiddle, look for gifts at Ed's Books & More, and admire the sheer force of Uisge Ban Falls. To find ratings, more things to do, where to stay, and tourist information, read our Sydney vacation builder. Traveling by combination of bus and flight from Halifax to Sydney takes 2.5 hours. Alternatively, you can drive; or take a bus. Expect a daytime high around 23°C in September, and nighttime lows around 12°C. Wrap up your sightseeing on the 23rd (Sat) to allow time to drive to Ingonish. When in Ingonish, make a side trip to see Saint Peter's Church in Cheticamp, approximately 1h 30 min away. Spend the 23rd (Sat) exploring nature at Cape Breton Highlands National Park. To see photos, reviews, more things to do, and more tourist information, refer to the Ingonish trip itinerary maker. You can drive from Sydney to Ingonish in 2.5 hours. Expect a daytime high around 24°C in September, and nighttime lows around 12°C. Wrap up your sightseeing by early afternoon on the 26th (Tue) to allow enough time to drive to Truro. Truro is a town in central Nova Scotia, Canada. Explore Truro's surroundings by going to That Dutchman's Farm (in Upper Economy), Joggins Fossil Cliffs Centre (in Joggins) and River Rafting & Tubing (in Maitland). There's much more to do: stroll through Victoria Park, stop by Truro Farmers Market, head outdoors with Fundy Tidal Bore Adventures, and tee off at Northumberland Links Golf Club. For reviews, ratings, more things to do, and tourist information, read Truro holiday planner. You can drive from Ingonish to Truro in 4.5 hours. Other options are to do a combination of car, flight, and bus; or do a combination of car and bus. In September, plan for daily highs up to 23°C, and evening lows to 9°C. Wrap up your sightseeing on the 30th (Sat) early enough to drive back home.